While I didn't veer too much off my proposed design (shown above), this project was not without its challenges. Fortunately, UGA Admissions (and I) were very happy with how Terrell turned out! Terrell's dorsal region features a map of the northeast part of campus. This part of the final work is the only thing that wasn't in my original proposal - and it's possibly my favorite! Terrell Hall is the red one, of course. Terrell's right side is a party! The "congrats" banner continues through the iconic Arch, reflecting the tradition (or superstition) that students are not to walk through the Arch until after they graduate. The fireworks refer to the electronic ones that accompany electronic acceptance notices as well as the real deal that sparks at graduations. 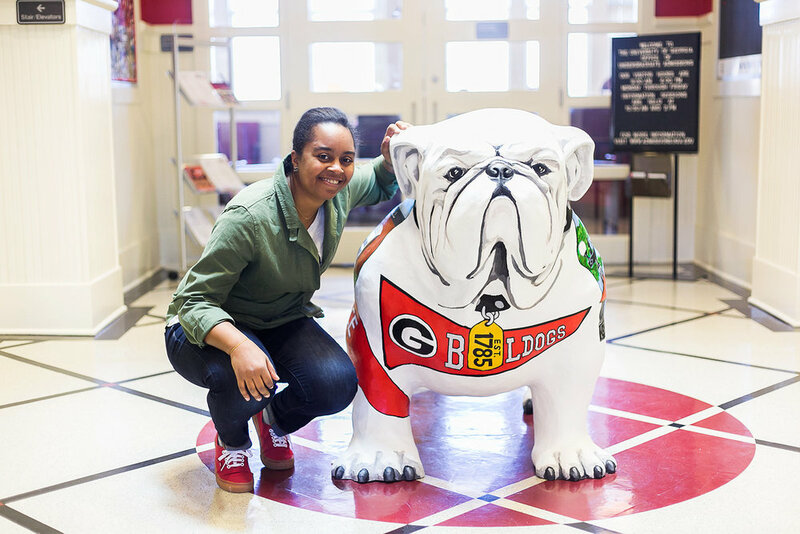 Terrell's right side reflects the "first step of an amazing journey" - applying and being accepted to UGA! The "Official Acceptance" banner has adorned acceptance letters for many years - certainly, since 2002! Terrell's namesake, Terrell Hall, home of UGA Admissions, appears on his shoulder. 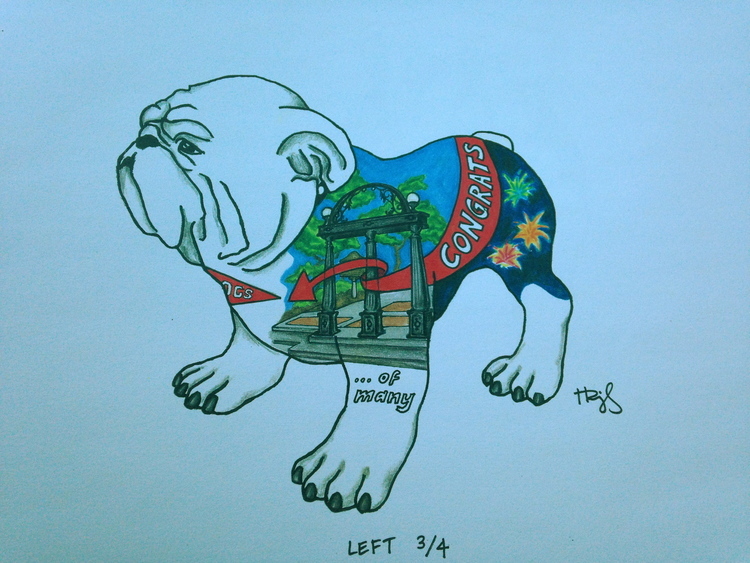 I wanted Terrell's front to be recognizable as an actual bulldog - the proud mascot of UGA. 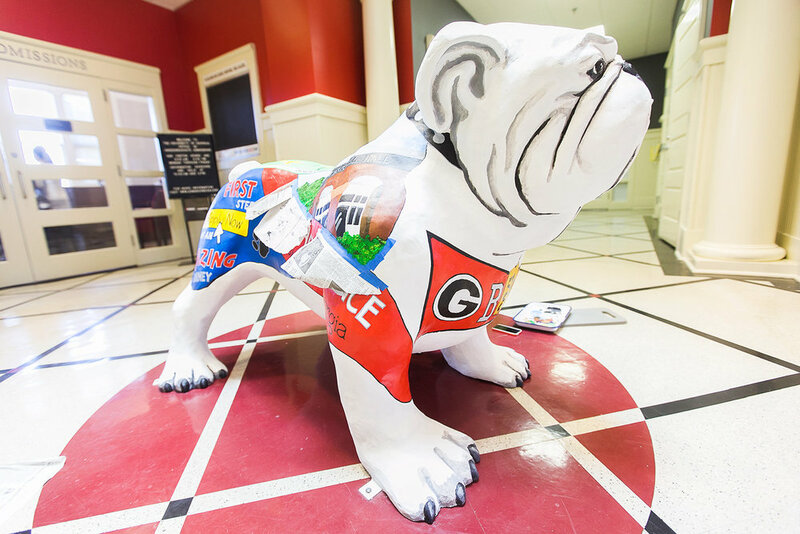 The spirit of the pennant and dog tag (with the year of UGA's charter) offer a great photo op to his many visitors (including future Bulldogs).